The membership of Renewal Choir is made up of people representing diverse communities of the local area. As part of Bristol’s thriving expressive and creative scene, Renewal is committed to participating in a range of community events to keep in touch with local people and grass roots organisations in and around Bristol. Past activities have included participation in The Southville Arts Trail, Knowle West Community Outreach at the Mede Centre, a ‘Gospel Evening’ at the Golden Lion Pub, Dialect Radio based at the Commonwealth Museum, Black History Month Caribbean Evening, Melksham, the United Housing Association’s Anniversary Celebration and the ‘Help for Haiti’ concert which took place in Knowle West. 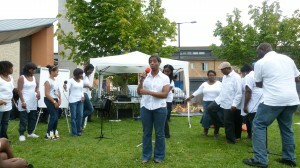 Want to book Renewal choir for your Community Event?